A chilled layered dessert with mango and rabri (sweetened reduced milk) as the main ingredient. It has a cooling effect because of the basil seeds and mango ice-cream. Perfect for the hot summer days. 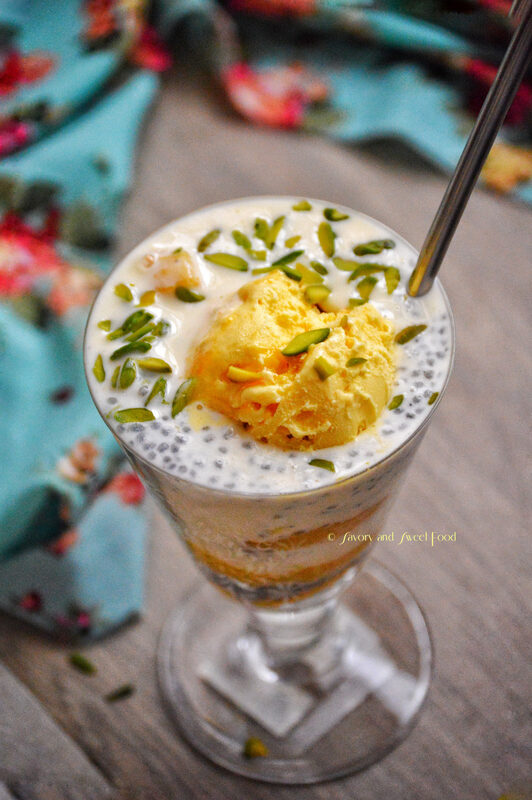 Falooda is a very popular dessert in many regions of India, Bangladesh and Pakistan. It is originally a Persian dessert, which was named faloodeh. This dessert was brought to India by the Mughal Empire. Traditional Falooda is made by mixing rose syrup, vermicelli, basil and pieces of jelly with milk and mostly topped with a scoop of ice cream. So back to the recipe, I decided to make rabri to make this falooda even yummier and I am so happy that I did. It came out great and all the flavors were so beautifully merging together that I just couldn’t control my happiness. This recipe is a keeper for sure. I am planning to make this again tomorrow. You guys should try it too. If you get falooda sev, use that. You can add mango jelly too, if you like. To make it even richer, add one scoop of ice-cream in the middle layer and another scoop on top. If you making rabri with more amount of milk, it will take longer for it to thicken. Bring the milk to a boil. Simmer on medium high heat, stirring regularly for 15 minutes. Add condensed milk. Cook for another 10 minutes. Add in cream and cook for 5 minutes. The rabri should be medium thick by now. It shouldn’t be too thick as it will thicken further while refrigerating. If it turned very thick, pour a little more cream or milk. Refrigerate overnight or for 4-5 hours. Soak the seeds in 1 cup water and let it stay for 1 hour till it blooms. I kept mine overnight. Add vermicelli in boiling water and let it boil till it gets cooked. Drain and wash in cold water. Skin the mangoes and make puree out of two mangoes with 2-3 tbsp of sugar. Dice the other mangoes and keep aside. Refrigerate the falooda glass for half and hour. Take out the glass, add diced mangoes. Add in a tbsp of basil seeds, then vermicelli followed by the mango puree. Pour in rabri. 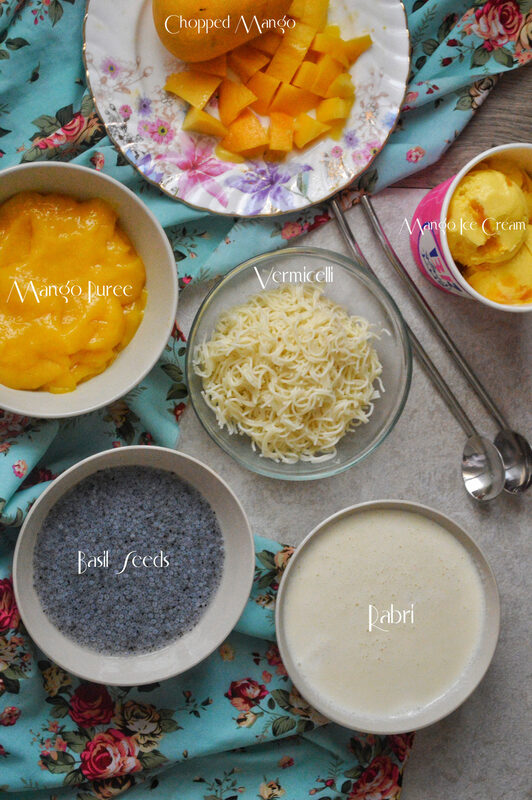 Then basil seeds, mango puree, vermicelli, mango and then rabri. Finally top it with mango icecream and nuts and serve immediately. 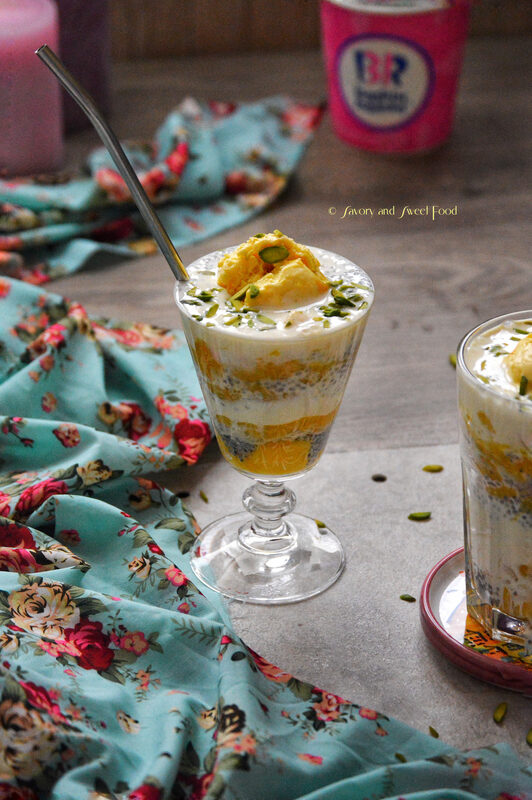 A chilled layered dessert with mango and rabri (thickened milk) as the main ingredient. It has a cooling effect because of the basil seeds and mango ice-cream. Perfect for the hot summer days. Add in cream and cook for 5 minutes. The rabri should be medium thick by now. It shouldn't be too thick as it will thicken further while refrigerating. If it turned very thick, pour a little more cream or milk. Refrigerate overnight or for 4-5 hours. You can add mango jelly too, if you like. To make it even richer, add one scoop of ice-cream in the middle layer and another scoop on top. 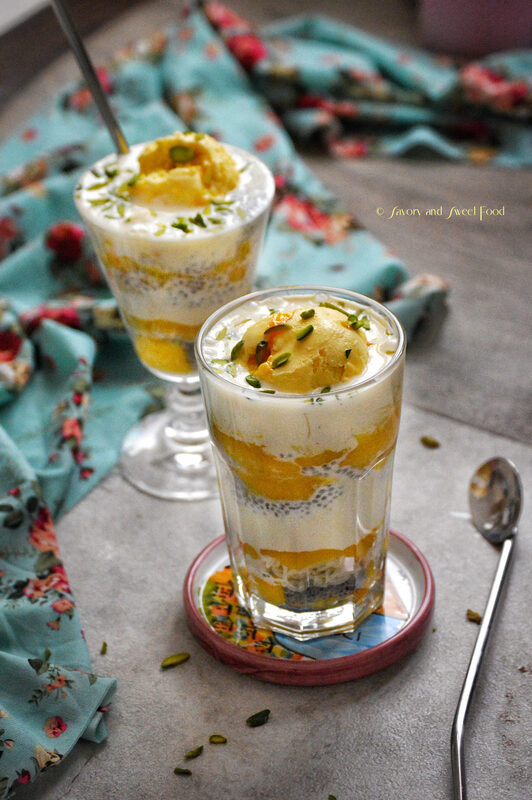 My long time to do list!Mango Falooda looking absolutely delicious!Woow and that layer of rabri and mango pulp,will be melt in mouth isn’t it?Will try it out soon! Yeaah it really is very yummy. Please try it. Hope you will like it. Hi sadia. Hope you are doing good. That looks amazing . Just had a small doubt. From the above mentioned quantities how many glasses can you get? Hello Amreen. Thank you . You can get 4 glasses with this. Okay. Thankyou. Going to give it a try tomorrow for a party. Hope it becomes a success story. 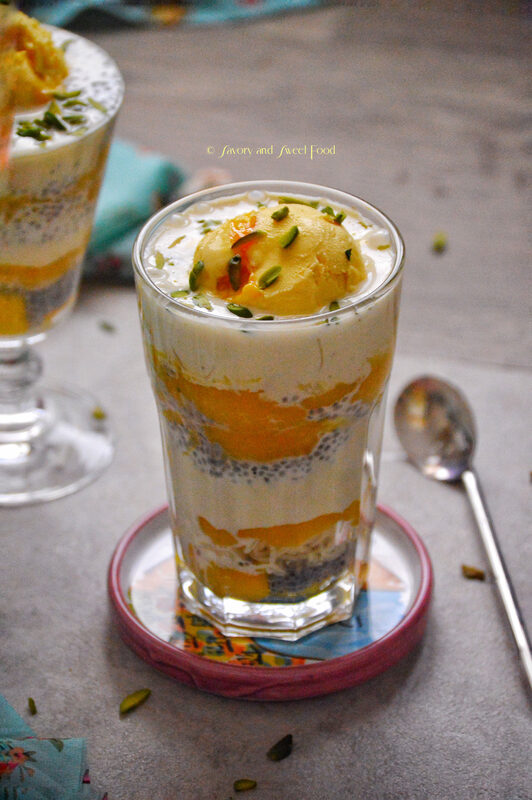 I am staring at your mango falooda… have been wanting to make some but then haven’t got my hands onto it, since trying to reduce my sweet intake (trying yet not successful! 😉 ) Love the idea of using rabri, will make it more thicker and rich too… awesome clicks as usual! Thank you Rafeeda. I guess now is the best time to make this. Hope you get to try this recipe. Tried making it .. it was yum..
what will be the correct consistency after refrigerating ? Rabri tends to get thick once you refrigerate it. So you have to stop cooking it once it reaches a semi thick stage. 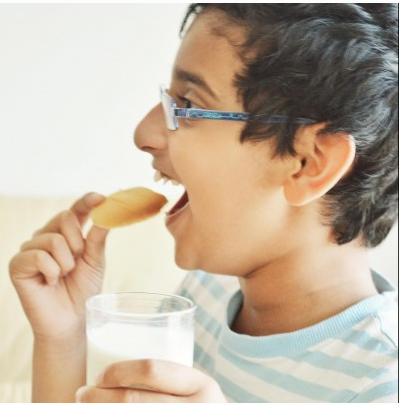 But you can easily make it loose by adding cold milk to the thickened rabri and make it into the consistency you want. Okay thank you for that .. Going to make it again for Eid.. will be more careful this time..